Some restrictions apply - No fireworks, pets, or indoor smoking. Garage not available for rentals, no more than 10 guests may rent. Home is not rented to Spring Breakers! This beautiful, newly constructed home is located in the newest and nicest development in Puerto Peñasco, Costa Diamante. The home is located only a few short steps from the beach. The beach is wide and sandy, and if you choose this home, it is only a short walking distance to the Sonoran Spa and Princesa de Peñasco Condominiums. Here there are stores and restaurants, as well as spa services. 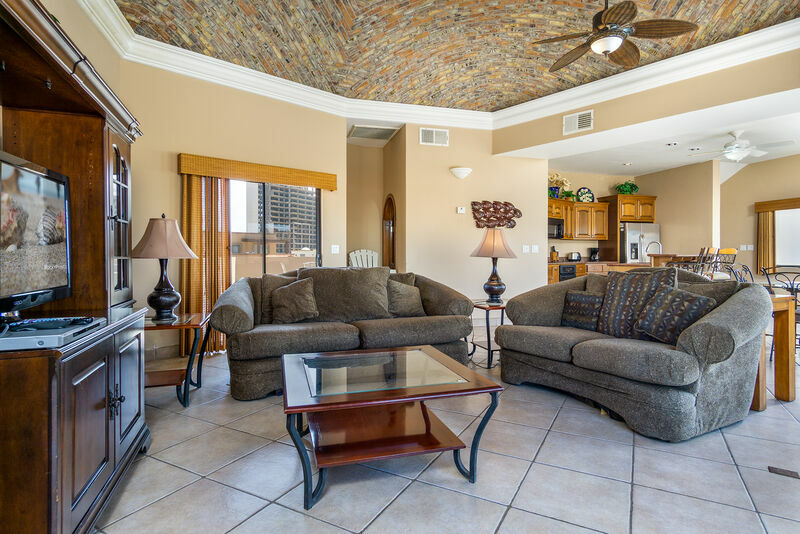 The home is located only about 5 minutes from downtown Rocky Point, so access to restaurants and entertainment is quick and easy. The home features 2 master bedrooms with king size beds, a third bedroom with 2 queen size beds, and a fourth with another queen size bed. All of the bedrooms are located downstairs. Upstairs you will find a fully equipped kitchen with all appliances and utensils, dining room and a nice living room. Other amenities include, A/C, hot and cold running water, propane BBQ, washer and dryer. Owner request no pets and no smoking inside. The pool is now open but is not heated. 08/06/18 02:43am Kaylynn Excellent location. I continue to return to this location and rent through seaside rentals. This house is in the perfect, safe, comfortable location. I love the beach in front of the neighborhood in comparison to the way overly crowded resort beaches. Any issues seaside immediately fixed. I have recommended this place to others and will continue to. 06/25/14 10:05am Elizabeth Tenemos 6 años o mas rentando la misma unidad los 6 amigos.El area es exelente se nota muchas mejoras siempre limpio la alberca y el Wi-fi son un exelente plus. Pero no asi la unidad en cuestion que cada año ke año ke vamos esta mas detereorada tanto fisicamente como el moviliario en cuanto la limpiesa no tengo ninguna queja pero si recomiendo el mantenimiento y decoracion ya ke la primera vez ke la rentamos era una casa preciosa. Tanto a mi Familia como ami nos encanta la tranquilidad y belleza del area y siempre lo recomendamos a nuestro Familiares y amigos. 03/17/13 11:21pm Victoria Front dest ladies were extremely helpful from when I called to make reservations to checkout. Condo was beautiful and furniture was very nice. A small pool area would be nice though. Other than that, we enjoyed our stay very much.